Obstructive sleep apnea - a disorder that affects nearly one out of four people between the ages of 30 and 70 - is a common cause of high blood pressure. In the Aug. 17, 2016, issue of the journal Science Signaling, researchers based primarily at the University of Chicago describe the signaling cascade that leads to this form of hypertension and suggest ways to disrupt those signals and prevent elevated blood pressures. "Our results, using a rodent model, establish a mechanism that is the cause of apnea-associated hypertension," said study leader Nanduri Prabhakar, PhD, director of the Institute for Integrative Physiology and Center for Systems Biology of Oxygen Sensing at the University of Chicago. "They also offer a novel way to block the process, preventing this form of hypertension and restoring normal blood pressures." The connection between sleep apnea and high blood pressure begins in the carotid body, a small cluster of cells located in the carotid arteries, which pass through the right and left sides of the neck. Chemosensory cells in the carotid bodies constantly measure oxygen levels in the blood and use that information to regulate breathing. 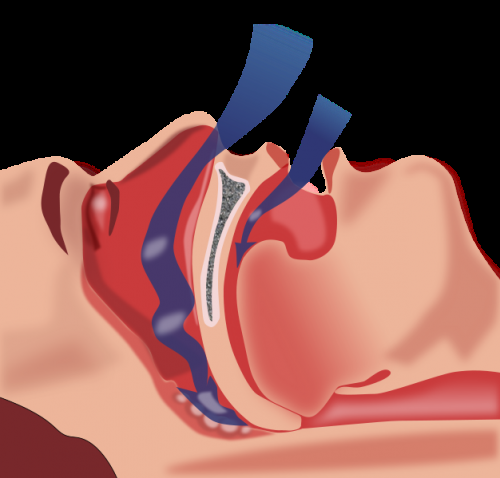 When people with sleep apnea periodically slow or stop their breathing during sleep, their blood-oxygen levels plummet. The carotid bodies recognize this deficit and quickly release signals to increase breathing and bring oxygen levels back to normal. These signals, however, can also increase blood pressure, which can lead to strokes during sleep. "In both central and obstructive sleep apnea, the acute elevations in blood pressure associated with apneic episodes may predispose patients to hemorrhagic stroke, while chronic hypertension increases the risk of heart failure," the authors wrote. "Thus, controlling hypertension in sleep apnea patients is a major clinical problem." So the researchers carefully mapped out the chain of signaling events that began with sleep-disordered breathing and led to the onset of hypertension. When an episode of apnea causes low blood oxygen levels, the carotid bodies quickly detect the decrease and begin to generate reactive oxygen species (a natural byproduct of the normal metabolism of oxygen). These inactivate heme oxygenase-2, an enzyme that generates carbon monoxide (CO). This leads to an increase in hydrogen sulfide, which stimulates the carotid bodies to send out chemical signals to take in more oxygen. Unfortunately, those signals also stimulate the sympathetic nervous system and cause blood vessels to constrict, boosting blood pressure. The standard therapies for hypertension caused by constricted vessels "do not work in this form of hypertension," Prabhakar said. In the 1960s, when the relationship between the carotid bodies and asthma was being first investigated, researchers tried to treat the disease by surgical removal of the carotid bodies. However, some of those patients developed sleep apnea. Although carotid body resection prevented hypertension, that approach came with serious side effects. Because they lacked the urge to breathe more during exertion, patients were unable to exercise safely, Prabhakar said, adding that "some died in their sleep from extended apneic episodes." The authors suggest instead that drugs designed to inhibit the enzyme cystathionine-y-lyase - required for the production of hydrogen sulfide, the signal to increase oxygen intake - could be used to disrupt the cascade of signals leading to apnea-related hypertension. "A major finding of the present study is that blockade of hydrogen sulfide synthesis is sufficient to prevent carotid body activation and hypertension in intermittent hypoxia-exposed rodents," the authors note. Treating rats with a cystathionine-y-lyase inhibitor L-propargylglycine (L-PAG) "restored normal carotid body function, sympathetic nerve activity and blood pressure, and blocked hypertensive responses to simulated apneas." "Our results," they conclude, "suggest that inhibiting cystathionine-y-lyase to reduce hydrogen sulfide signaling in the carotid body with more potent inhibitors than L-PAG may be a novel approach to treat hypertension in patients with sleep apnea."